The children's game was developed for kids aged six through eight, and it allows users to play a variety of mini-games with Ariel, Belle, Rapunzel and Tiana. 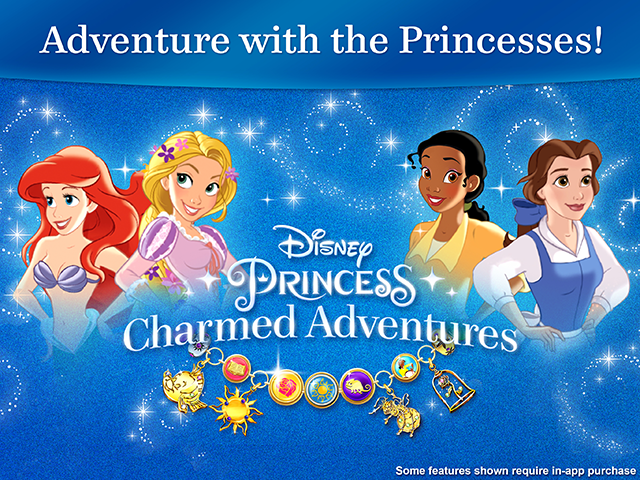 Disney announced the release of Disney Princess: Charmed Adventures on iOS and Android. The children’s game was developed for kids aged six through eight, and it allows users to play a variety of mini-games with Ariel, Belle, Rapunzel and Tiana. Players will collect charms for their virtual charm bracelets as they complete activities. For instance, players can earn a Pascal charm by helping Rapunzel find Pascal in a hide-and-seek style game. Users can drag individual charms to their charm bracelets to decorate them, and they can take pictures of their bracelets to share with others. While Disney Princess: Charmed Adventures is free to download, only Rapunzel’s world and mini-games are available for free. Users can unlock the worlds of the other three princesses through in-app purchase. Specifically, users can purchase each individual world for $3.99, or they can purchase all three worlds (Ariel’s, Belle’s and Tiana’s) in a bundle for $14.99. This bundle also contains additional charms for players’ bracelets. Finally, users can purchase additional charms in bundles in the game’s store. Disney Princess: Charmed Adventures is available to download for free on the iTunes App Store and Google Play.